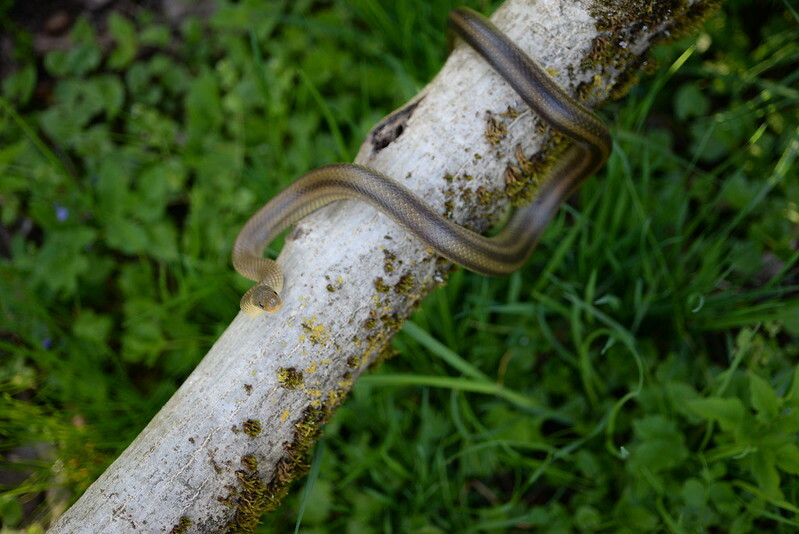 A friend of mine sent to me this picture, of a snake he has found in his garden, in the hills of Oltrepo' Pavese (Pavia, Northern Italy). It happened to me in the past to find in the same hills yellow striped longissima, but the cases were not so common: especially the cases of specimens so well striped to resemble a Pantherophis obsoletus quadrivittatus! This specimen, photographed by my friend Max, is so well striped that a picture on the Forum is really worth it. No, Ilian: it has nothing to do with Z.lineatus. Ruggero Morimando wrote: No, Ilian: it has nothing to do with Z.lineatus. Ive seen a similarly striped individual that also lacks the white dots, that longissimuss usually has, in Slovenia this spring but sadly I did not have my camera with me aswell. Sure, if you say so. As I said I have no clue about lineatus and longissimus in Italy. However, without saying that this individual has anything to do with lineatus, I'll tease you about you ID features for lineatus You are saying the two species are "VERY" different and then list the features you think make them different - "size, colours, markings, baby markings and so on..." but then you go ahead and explain that "the presence (or absence) of the stripes has nothing to do with the species: you can find Z.lineatus specimens without stripes (take a look on the web) or Z.longissimus specimens with well marked stripes". And I know for a fact that the two species could have different shades of colurs from light yellow-brown to black (in longissimus). So basically from all the features you listed only "size" would be reliable because obviously colours and markings are very variable From studying photos it seems to me that the most reliable and/or consistent feature are those red eyes in lineatus. To summerize I would NOT say these two species are "VERY" different because excluding the (variable) colours they have pretty much identical pholidosis, body and head shape and structure, scale shape and texture, etc. It's similar to the two Malpolon species - the same snake coloured a bit differently. For me an example of closely related species that are similar but at the same time very different would be N. natrix and N. tessellata. It's well shown in the book "A monograph of the colubrid snakes of the genus Elaphe, Fitzinger" by Schulz. Zamenis longissimus are "beasts" that can attain 225 cm in total length, with brown eyes... Very different!!! Base colour variation is much more limited in lineatus, imho - nearly all pale brown. Jeroen Speybroeck wrote: Base colour variation is much more limited in lineatus, imho - nearly all pale brown. True...I thought about it while I was writing my post.